The Qadan people of what is today Syria and Lebanon (13,000 - 9,000 BC) predated the Phoenicians by several millennia, and it is believed that they may have been among their earliest ancestors. For reasons yet unknown, the voice of One From the Litter of the Ages (OFLA) refers to this spirit as Her “Kind Phoenician PooPoo” or “the Phoenician Ladyspirit.” The timeline for the Phoenicians and the age OFLA assigns to the Ladyspirit (9,000 years BC) are in conflict, so it is most likely the Phoenician Ladyspirit was a Qadan. Not much more is shared about the Qadans, other than they were among the first humans to wear hats on fishing trips, roll textile threads into Small Balls, and cuddle with Orange Cats in the “spooning” position. The Phoenician Ladyspirit is revealed as the Yidgetator of All Things Knowable, and is the Universal Director of OFLA, who shares the messages of the Mew Age through the Bunderflouch of the Bebbeh Kittin-m'yahoo. It was the Phoenician Ladyspirit who thousands of years after the exile of QooQoo and Nubu would give OFLA her powers to guide Jesus Christ throughout his boyhood and teen years. And nearly 2,000 years later, provide Dr Rex Bremerton of Seattle, Washington the Good Mews! OFLA has revealed that the Sons of the the Phoenician Ladyspirit were QooQoo and Nubu, the Original Procurers of Raw Meats and Stiff Man’s Chief Servants in the Great Hall of Tuna. QooQoo and Nubu are characterized by OFLA as early Phoenician or Qadan fish market owners, who resided in a section of their village known to attract Cats by the thousands. Most other residents of this neighborhood were young artisans, poets, musicians, and pleasant, well-groomed men described as "Lifelong Bachelors." The other residents of the village grew increasingly intolerant of the neighborhood’s growing Cat population, and the bawdy antics and loud ceremonies organized by QooQoo and Nubu. They were eventually exiled from the village. 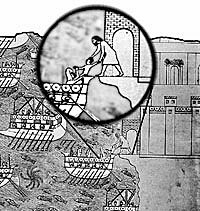 OFLA tells us that Great Prides of Cats followed QooQoo and Nubu’s fishing vessel, as they sailed south in the Mediterranean to the banks of the Nile, near what is today, Cairo, Egypt. A chain of unexplainable, cosmic events that preceded even the construction of the Pyramids culminated with QooQoo and Nubu founding the Great Hall of Tuna, a world apart from our own -- made in nine days almost entirely of Raw Meat, Chicky, and Tuna -- and connected to our planet by the Hamboogie Bridge. OFLA has revealed to Dr Rex Bremerton that She was once an Earthbound Cat, born to Mother Velvet, at the precise moment of birth of the most famous person in world history, Jesus Christ, directly beneath his manger. While present on Earth -- and by the powers of the Phoenician Ladyspirit -- OFLA accompanied and guided Jesus throughout his childhood and teen years, assisted him with his comedy and sleight of hand routines, even wrote much of his material. When the boy Jesus showed a flair for carpentry, OFLA influenced him to design elaborate Scratchin’ Posts, one of which remains the most enduring symbol of Christianity, a cross upon which he was willingly tortured to death. Artistic and personal differences -- along with Jesus’ deteriorating mental state -- began to strain their relationship, and it was about this time OFLA and Jesus parted ways. Jesus’ popularity and fan base would continue to increase, but by his early 30s, the quality of his work diminished, becoming more about fasting and abstinence, less about turning seawater into booze. About this time, Jesus contacted OFLA and asked Her to help with his memoirs. She accepted his offer, but before they were completed, Jesus volunteered to be executed by a crowd of drunk Romans. The unfinished memoirs would become known as the Half ‘n Half Scriptures, and not long after, stolen by the president of Jesus’ fan club. Hundreds of years later when the Romans were putting the Bible together, the Half ‘n Half Scriptures resurfaced, but were regarded as “too surreal and odd” for inclusion, and discarded in favor of the Four Gospels quoted and studied by Christians today.